My landlord put a Buddha on the back deck of the house I’m renting. This statue is about two feet tall at most, a slender Indian Buddha, not the jolly fat Chinese kind, and he has a seam on his right shoulder that shows where he was broken out of a mold. He’s a mass-produced Buddha. A few weeks ago, I was sitting for meditation after my yoga practice and noticed that his hands were in dhyana mudra, which I was about to use to center my mind. (Imagine the classic thumb-to-first-finger jnana mudra joined by sliding the hands together so the tips of the thumbs and the nails of the first fingers touch.) Dhyana means concentration, the most difficult stage in yoga for many people, myself included. His eyes are closed and he has an infinitely subtle Buddha smile, an expression that somehow conveys deep and effortless focus, immersion in what Buddhists call “lovingkindness.” As I sat with my eyes open, held the mudra and gazed at him, I felt the peace and stillness of that smile. I’ve never used any kind of spiritual or religious imagery for meditation, so I found this effect intriguing. I’m an extravert by nature, and I wondered if this mirror of true inwardness was what I needed, or if I was just borrowing serenity. Over time I’ve started to feel my mind fall into quietude from a mere glance at the Buddha, whether he’s glowing in the moonlight or showering in a thunderstorm. I like to think that the artist who made the original put something special in that face, and understood that mudra. It makes me glad this Buddha is mass-produced. Somewhere, someone else is smiling back at him. Hundreds of people, hundreds of smiles, petals of peace in a single flower. On an ordinary quiet night, I took a break from writing to make a cup of herbal tea. Suddenly, I was in the dark. Tea freshly brewed, and I couldn’t even see the mug. I had to feel the doorway to get out of the kitchen. Funny how the mind works. I have to find light, I have to find light. In the living room, my laptop had gone to sleep on the coffee table, and I found it by the tiny red dot on its rim. I woke it up and used it to see my way around, searching for things I knew I didn’t have. Matches. Flashlight. Sudden change and loss are hard to accept. I’ve been reading two books that deal with this topic: Barbara Kingsolver’s Flight Behavior and Marc Ian Barasch’s The Healing Path. The first is a novel about both ecological and personal crises; the second is nonfiction, about facing life-threatening illness. My response to the simple lack of electricity confirmed what these writers say about how humans react to an unwelcome shift in circumstances. We want normal. I kept thinking I could go into another room and turn on a light. No. There’s no power. The whole town was dark. Then maybe, I thought, I could sleep through the outage. No. There’s no fan, no air conditioning. What was I going to do in the dark with my laptop battery running low? It was 11:30 p.m. and that’s when I do my best writing. I shut off the laptop after I’d found my Nook, which had more charge, and took it and the mug of tea outside, using the Nook as kind of dim little flashlight. I thought, I can read. No. Not once I’d seen the stars. Then, all I wanted was the stars. Even in the desert in a town with little night glare, the removal of all manmade light was … breathtaking? No. Awe-inspiring? Too weak. Sacred. I didn’t do anything to pass the time in the powerless night. I just lay back and looked at it. Thoughts drifted in. How long will this last? Should I pack up and go to a hotel in another city? I didn’t move. Stars. The lingering craving for electricity grew weaker and weaker. This is it. The dark still night, afire with diamonds in its endless depths. The ordinary and normal gone. Someday my power will go off, and that will be it. Maybe it will be like the kitchen was, blind nothingness. Maybe it will be like the brilliant, hidden, undiscovered sky. All I know is that I had that sacred moment under the stars, and that I chose not to miss it. In my endnotes for my books, I explain few details about settings and research. At the end of Soul Loss, I mention that the other businesses in the story are fictitious, but Sparky’s in Hatch, New Mexico is real. I got an e-mail from a reader who found that fact—quite understandably—hard to believe. Not that she thought I was lying. She was simply marveling that such a place could exist. In the middle of a 100 degree Sunday afternoon, in a dance hall that serves no alcohol, the Desperadoes played Western swing while couples two-stepped on a dance floor framed by walls full of antique advertising signs and shelves and glass cases crammed with old piggy banks, cookie jars, radios and little robots. High on one wall, a Rajah Motor oil neon sign glowed between a couple of other neon antiques and a mounted deer head with a big hot pink butterfly perched over its right ear. An old metal diving helmet was displayed at the other end of the neon row. The bas-relief of the skeletal rider on a skeletal horse that I mention in the Sparky’s scene in Chapter Two is still there, but there’s always something new or rearranged. Sparky’s is a living organism of sorts. The interior has expanded to include a third room between the restaurant counter area and the dance hall, and the décor there is Sparky’s best. 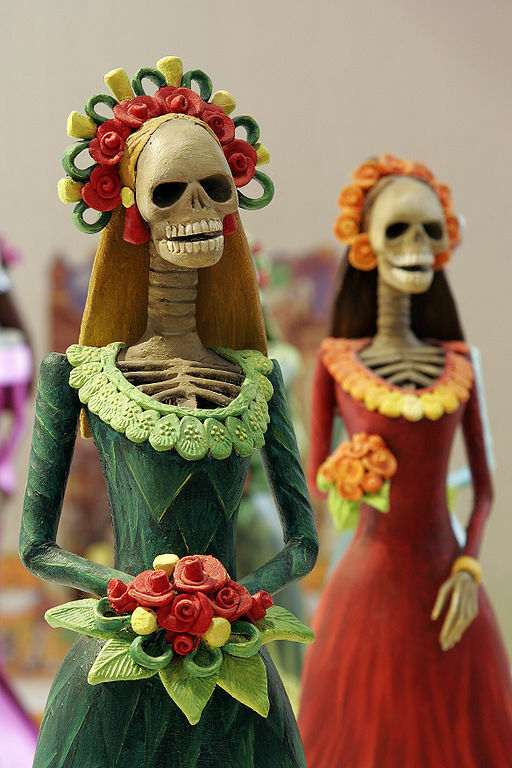 The skeletons who used to occupy the passage to the restrooms are once again in somewhat piratical garb, and have joined a tableau over the door of the new room along with an old wooden jukebox and a collection of Catrinas, the elegantly clad skeleton ladies of the Day of the Dead. You will never run out of “whoa, I didn’t see that!” discoveries at Sparky’s. The giant advertising statues outside have new companions. On top of a monster KFC cup, a green chile wearing lipstick and a bridal veil holds hands with red chile in a top hat as they beam at each other in nuptial devotion—a match made in Hatch. Sparky the robot, his fountain espresso cup ever-flowing, gets new decoration. Sunday he was wearing goggles and some red-white-and-blue stars. Inside, more musicians have autographed the wall behind the stage, where the one thing that never changes is the sign that says, “Do one thing every day that makes you happy.” If you’ve set foot in Sparky’s, you have already done that. Need pictures? Check out Sparky’s Facebook page. Good food and good music in the strangest-best place for both. Posted on July 3, 2015 Categories Behind the Stories: Inspirations and EncountersTags beauty, creativity, free time, hot springs, Truth or Consequences, writing1 Comment on Out of the Office!